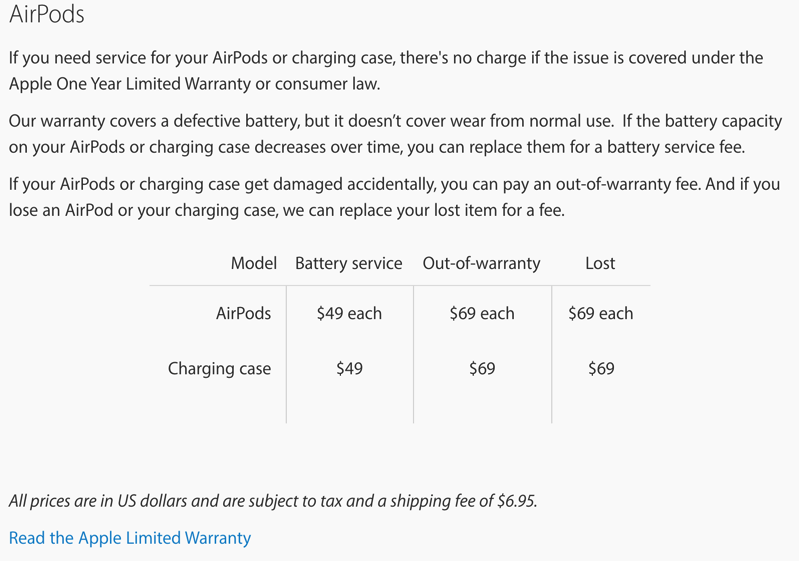 Apple’s iPhone repair and servicing page has been updated to note replacement costs for AirPods both in and out of warranty (via MacRumors). The page was updated to also indicate how much it would cost to replace an individual AirPod or the charging case, if you lose them (which can be easy given their tiny footprints). To replace a lost individual AirPod or the charging case, it’ll cost you $69 USD, which is 43% (updated) of the cost of the $159 USD retail price of a new set of AirPods. As for Canadian pricing, if we convert the US replacement cost into Canadian it works out to $92. The bottom line—you should keep track of your AirPods and the charging case, or you can buy Spigen’s AirPods Strap for $15 (or you can get a similar knock off cheaper on eBay for $3-$4 USD shipped, if you don’t mind waiting a month). Earlier, it was noted the price to replace AirPod batteries within warranty are $0, while out of warranty battery replacements would be $49 USD. AirPods went on sale this week online, with first shipments set to arrive as early as December 20th, while Apple Stores are expected to launch sales next week. Online sales right now show delivery times of 6 weeks.